We have monthly afternoon work parties on the first Sunday of the month from October to June, and twice monthly evening work parties on Wednesday evenings during June, July, August and September. When: Spring and Summer: From May to September work parties are held every second Wednesday evening from 6:00 PM to 8:00 PM. Fall and Winter: From October to April work parties are held the first Sunday of the month, from 1:00 PM to 3:00 PM. * No work party on November 16th. For a map of the location of the next work party and further details, please see http://1drv.ms/1jDP7KY. Where: Our meeting site varies, depending on the work we are undertaking. If you are already on our volunteer email list, you will be sent an email prior to each work party, describing the meeting place. If you are new to our group, please call Sharon at 250-479-0491 to confirm the location and to be put on our mailing list. Please Bring: Gloves, weather-appropriate clothes (long sleeves and pant legs are a good idea to protect your skin), sturdy footwear, and your favourite clippers or loppers if you have any. Sunglasses and water are a good idea. We Will Supply: Tools, extra gloves, cookies and juice. Everyone is welcome, but please leave dogs at home. Hope to see you there! Join us for some exercise and fresh air, and meet other conservation minded folks. For more info, please phone Sharon at 250-479-0491, or Russ at 250-658-5167. 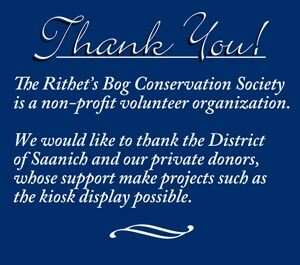 Rithet’s Bog Conservation Society (RBCS) is a registered non profit Society dedicated to the care and stewardship of Rithet’s Bog Conservation Area, which contains the last remaining peat bog on the Saanich Peninsula. This Saanich park was donated to the municipality by the Guinness family of Britain in 1994 and subsequently zoned as a nature sanctuary. 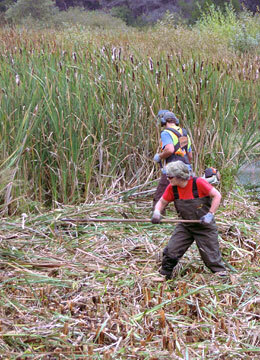 RBCS works closely with Saanich Parks, advising on the ecology and management of the park, particularly the bog ecosystem. Extensive educational material has also been developed by RBCS, including information on the post-settlement human history of the area. RBCS is a Federated Club of the Federation of BC Naturalists. 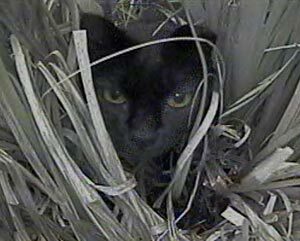 Cat predation on wildlife is a major problem in urban areas and this is especially true in isolated “islands” of natural habitat such as Rithet's Bog. Researchers have video footage documenting such predation on songbirds in the Bog, which can be viewed here. The Rithet's Bog Conservation Society takes the position that no cats should be allowed to remain in the Conservation Area. Efforts to relocate them are ongoing. If you find kittens in the Bog, call or email: Dee's Orphan Kitten Fund (Dee) phone: 250-896-5771 email: nkroschi@shaw.ca or Greater Victoria Animal Crusaders (GVAC) email: info@animalcrusaders.ca. Rithet's Bog Conservation area is home to several rare plant species. One of these, the Purple Sanicle, grows in a remnant Garry Oak woodland area below the Foxborough Townhouse complex. The population is struggling to survive due to the growth of broom, blackberry and invasive grasses. 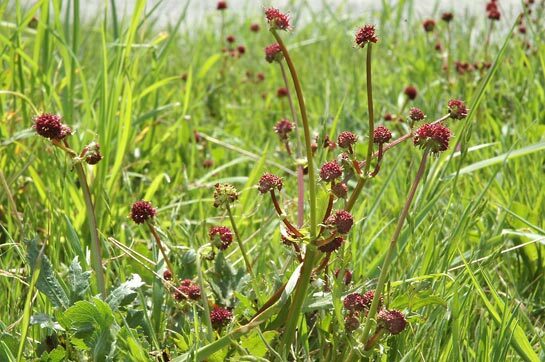 This winter the Garry Oak Ecosystem Restoration Team, a non-profit conservation organization, is producing a restoration plan for the Purple Sanicle population, and will be working with RBCS to remove broom and blackberry from the area. If you are interested in helping to protect this rare plant population, please contact Sharon Hartwell at 250-479-0491. 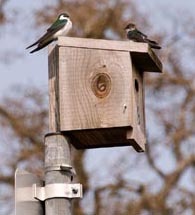 Violet Green and Tree Swallows are wonderful agents for biological mosquito control, but people who put up nest boxes hoping to attract swallows are often disappointed when English house sparrows take up residence. Victoria swallow enthusiasts Malcolm and Christina have produced an excellent video demonstrating how to create an oval-shaped entrance hole that will keep out the sparrows. For more information contact swallows@shaw.ca. the University of Victoria's Bullfrog Watch Program.